Running, throwing, kicking and catching help encourage children to find a variety of activities to get their heart rate up and to break a sweat, which medical professionals say are the keys for kids to live a healthy and active lifestyle. As football season kicks off, fans everywhere are grabbing the pigskin for backyard scrimmages. Now, they can also get in the game by playing on a field just like the pros do. The world’s largest children’s museum worked directly with the Indianapolis Colts professional football team to design a sports experience for kids and adults of all ages who love to play the game. The Indianapolis Colts Football Experience, within the Riley Children’s Health Sports Legends Experience, explores realistic aspects of the game on an open turf covered playing field. There are multiple football related interactive stations for children and adults of all sizes. 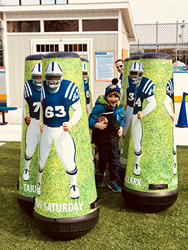 Legends-in-training can practice offensive and defensive moves among life-size Colts bounce-back tackle dummies and take part in passing challenges with a faux offensive line and a huge mat to make the landing on a diving catch a little softer. There are two goal posts for families to kick the ball through the uprights – free form or from a tee. One goal post is college regulation size and the other is closer to the ground for little ones. family health, fitness, and sports experience that will inspire visitors to be active while creating healthy habits that will stay with entire families for a lifetime. The football related skills in the Sports Legends Experience are varied and have a wide range of athleticism involved. Running, throwing, kicking and catching help encourage children to find a variety of activities to get their heart rate up and to break a sweat, which medical professionals say are the keys for kids to live a healthy and active lifestyle. Indiana’s professional football leaders have advice for those introducing the sport to their family, “Keep your expectations realistic, and don’t try to do too much, too soon. Start slow and build,” says Dave Hammer, Head Athletic Trainer, Indianapolis Colts. “Stick with conditioning methods proven by science and time, because there is no shortcut. Make sure you eat healthy and make sleep a priority. If you have questions, always seek advice from a professional. As much as the Colts love football, they still caution parents against having young athletes specialize in one sport too soon. “Interested kids should explore all their options, participate in multiple sports, and enjoy all the physical, mental and social experiences that athletics brings into our lives,” says Hammer. The fact that you need to engage with a partner or a group in order to throw or catch a football also helps encourage fitness because being a part of a group makes activities more fun and encourages children to keep participating and not get bored. Prospective football players also learn how to share and capitalize on each other’s strengths to be better teammates. Coaches in orange shirts and hats in the Indianapolis Colts Football Experience at the Sports Legends Experience direct families to participate in different skills and drills in an effort to promote physical activity, team building and good sportsmanship. It's all part of the world's largest children's museum. Families will also learn what it takes to be a legend on the field and learn about legends off the gridiron such as Reggie Wayne. Some of the Colts have even been to visit and take selfies, sign autographs and toss a few balls around.